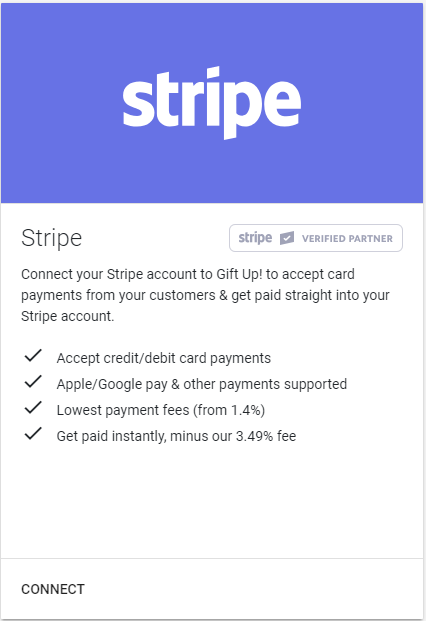 If you have a Stripe.com payments account, you can connect it to Gift Up! and we will take payments using your Stripe account, meaning you get paid for every sale (minus our 3.49% fee, and minus their small payment processing fee) in full straight away. 2a) You should be presented with a login screen (below) with Stripe, enter your Stripe username and password. If you do not see the login screen below, not proceed to 2b. Click "Forgot your password?" if you have misplaced your Stripe login credentials. 2b) If you are presented with a sign up screen asking for lots of information, like name, address and bank details etc... do not fill it in, instead click the link at the top labelled "Already have a Stripe account? Sign in (or Switch user)"
3) Click "Connect my Stripe account"
You should see the form below. 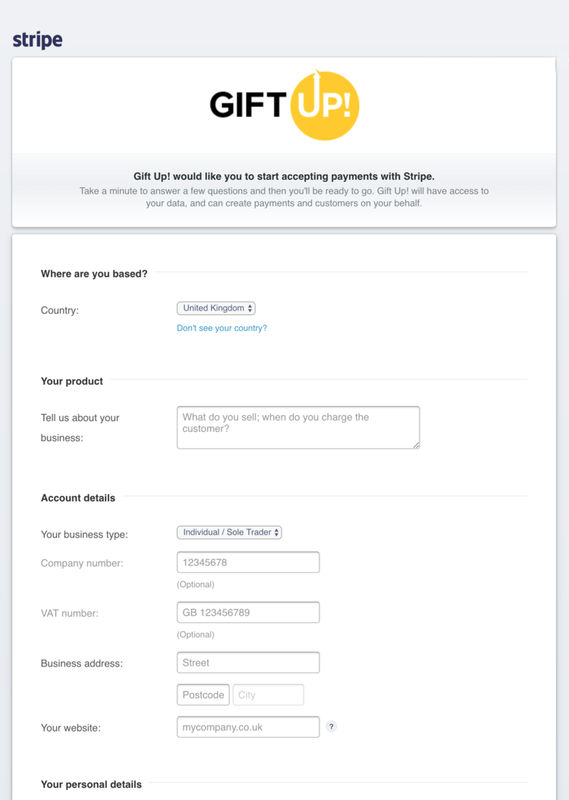 Please fill it out and click "Authorize access to this account" and your (newly created) Stripe account will be connected to Gift Up! and we'll use that to take payments for your gift cards! What payment methods are supported with the Stripe integration? We support all major debit / credit cards, iDEAL, Apple Pay and Google Pay. Message us to register your interest and let us know which payment method you would like us to support. Is 3D Secure supported for card payments? Yes it is. We have a separate guide on how to set it up.